I thought I was done with photographing the laughing doves for this breeding season, and then I saw them hanging out together on our fence. It seemed like they were discussing if they wanted more squabs this year or not. Or perhaps they were congratulating themselves on their successful brood having flown the nest a day before. Six days later I saw them in a tree just hanging out together. I happened to have my camera on me as I was shooting some other birds when this happened. It was all over in less then 12 seconds. They doves are back in the nest and this time I was able to get a much clearer shot. Doves will have up to three clutches in a breeding season. I'm so pleased we've been able to provide a safe environment for them to raise their young in. Great photos I love birds, I've just bought a new bird house in the hope I can take a few good pictures. Such crystal clear photos.I love the clarity you bring to let us into their world. 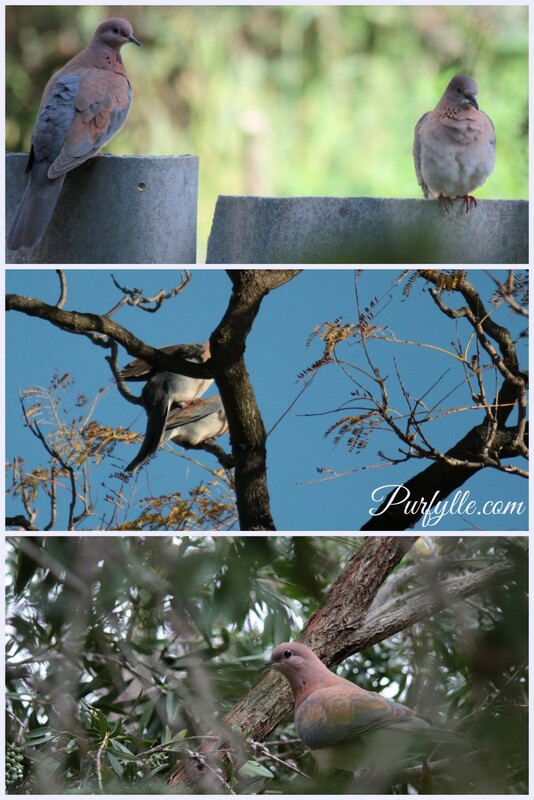 Beautiful photos - you really caputured the birds as a couple. Only 12 seconds??? Poor things. beautiful birds. hope any fledglings get to fly away before the snow arrives. :o) I'm sure that won't be a problem. I'm in Australia and we are coming into summer, I don't think there's ever been snow where I live.